Some folks think the Corn Exchange would have been a great location, others think the old Dalkeith High School site is the place to go. There is no shortage of ideas about where it might be and what functions it might fulfil. But there hasn’t really been much of a public conversation about all these possibilities until now, so how are we ever to make progress? At the Dalkeith Arts Centre on 23rd February, Councillors and Council Officers came together with dozens of members of the public to discuss the topic. Questions that came up included: What do we want from a Hub? What kind of facilities should it provide? Where do we think it should be? 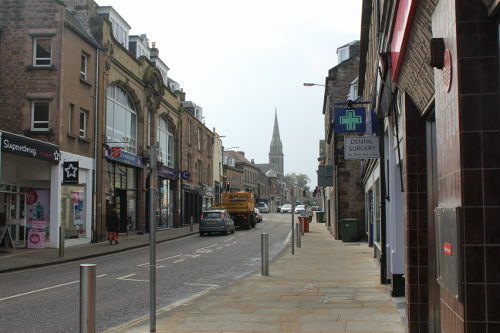 Does the consultation on the redevelopment of Dalkeith Town Centre give an opportunity for some completely new thinking on the topic? Is there a way to get big local developers involved and committed with support? How can we get the process moving and keep it moving until we see a result? Council Leader Owen Thompson made it clear that he would like the public to take a lead in developing ideas, concepts and a practical way forward to give our County Town facilities worthy of its importance to Midlothian. The Eskbank and Newbattle Community Council have created a survey to collect everyone’s ideas and comments.